There are only 7 weeks left in 2014. How will you spend yours? Just when things were threatening to settle down on the domestic front, my husband and I decided to stir things up by getting a new puppy. We pick her up on Friday. I’m really excited about this addition to our family, which is just further evidence of my questionable sanity. Meanwhile, way behind with the art class we’re taking together. Our house is really coming together, however — and this week we’ll be finishing off the last couple of significant projects. So it’s a big week. “Putting your intentions on “paper”…that is such a great tip and has helped me stay on track often enough to stress the importance of it! I love this provocation! I’m trying to learn to code, which is a creative endeavor unlike any other I’ve experienced! I’m still in the skill-building place (I prefer expressionism in most of my other creative endeavors, but haven’t quite figured out how to be a coding expressionist, haha! ), but my goal is to make something real by the end of the year. That’s vague, I know, but I just want it to be my own idea, and not something prompted or built in a tutorial. When I started a month ago, I had NO idea what I could even make with programming. Now I think I might understand some possibilities. I feel like I’m on the verge of a real idea, though I still don’t have an inkling what the idea will be! hi all , I left this weeks intention on last weeks post I was that anxious to list them on Monday. Big news is that I finished a portrait ! 7 weeks left of the year and how do I want to spend it? a good question to answer… I want to spend it wisely! I had a good year in that I quit an organization that was draining me and shifted my ambitions moving the house organizing which had remained on the back burner(even off the burner) for years and placing it at the front burner. office painting to resume, its the computer wall that I have left for last with a large scientfic lab table to move. make quick prep painting for that! Good luck with the puppy Miranda, my husband has been hinting for a long time… I want no parts of it. I like dogs but…. 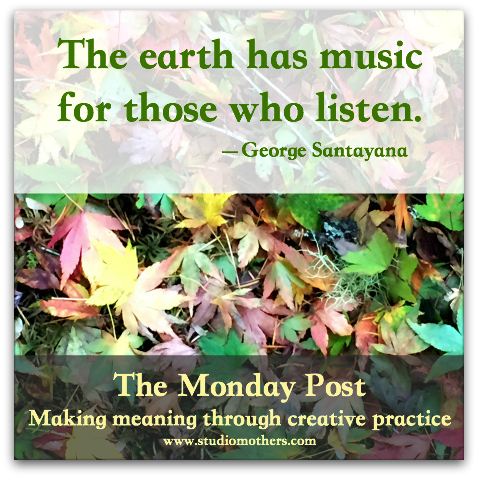 Ironically, one of my creative intentions for the week was to slow down and read this post, as well as a few others. 🙂 Does Sunday count as part of this past week? I’m happy to be here. Can’t remember how I came across this site, but I’m glad I found y’all.